Thursday and Sunday's games are finally in the books, which included some wild finishes! Let’s review some of the best and the worst fantasy performances from Thursday and Sunday’s matchups in Week 3’s Fantasy Football Wrap Up. Tom Brady finds himself as the top-ranked quarterback again this week, passing for 378 yards and 5 touchdowns with 0 interceptions. Brady ran for 6 yards and finished with 35.72 fantasy points in 4-point touchdown leagues. 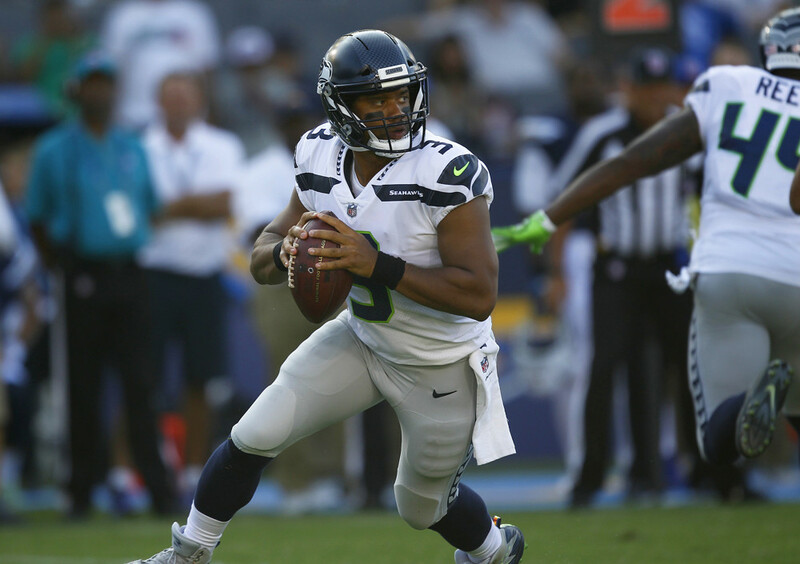 Russell Wilson was able to bounce back from a slow start to the year, throwing for 373 yards and 4 touchdowns, while also running for 26 yards against the Titans. Wilson scored 33.52 fantasy points and finished as the second-ranked QB of the week. Philip Rivers’ struggles against the Kansas City Chiefs defense continued, as he threw 3 interceptions while only throwing for 237 yards and 0 touchdowns. Rivers finished with 3.48 fantasy points, which was the 30th ranked quarterback of the week. Cam Newton failed to take advantage of a weak New Orleans Saints defense, throwing for only 167 yards and added 16 yards on the ground. Newton managed to run in for a touchdown but owners were left expecting more after only scoring 8.28 points on Sunday. Todd Gurley made Thursday Night Football exciting again, rumbling and stumbling for 113 yards and 2 touchdowns while hauling in 5 receptions for 36 yards and 1 touchdown. Gurley finished the day with 37.90 fantasy points and finished the week ranked as the highest scoring running back. Many Jordan Howard owners sat him this week, with reports of a shoulder injury and limited playing time due to the emergence of Tarik Cohen - that turned out to be a bad decision, as he ran all over the Steelers defense. Howard had 23 carries for 138 yards and 2 touchdowns (including the OT winner) while adding 26 yards receiving on a team-high 5 receptions. Howard finished the day as the second-ranked running back, scoring 31.40 fantasy points. Jay Ajayi entered this week with a dream matchup against the New York Jets’ poor run defense which had given up an average of 141 yards and 1 touchdown to running backs through 2 games. The Dolphins’ offense couldn’t get going Sunday, and Ajayi only ran for 16 yards on 11 carries. Ajayi had 2 receptions for 9 yards and finished the day with 4.50 fantasy points. Owners were expecting big things from CJ Anderson this week, fresh off a 154 total yard- 2-touchdown performance last week. With the offense not clicking like weeks prior, Anderson was only able to rush for 36 yards on 8 carries, and added 7 yards on 2 receptions, for a total of 6.30 fantasy points. Another week of practice with Case Keenum did Stefon Diggs wonders, as he burned the Buccaneers defense for 173 yards and 2 touchdowns on 8 receptions. Diggs scored a whopping 37.30 fantasy points and finished the week as the highest scoring wide receiver. Brandin Cooks’ breakout game finally came, hauling in 5 catches for 131 and 2 touchdowns, including a go-ahead score with 23 seconds left in the game. Cooks finished the week as the second-ranked wide receiver with 32.10 fantasy points. In a week that saw 43 wide receivers reach double-digit fantasy points in full PPR leagues, there were a few that failed to deliver. On Sunday night the Washington Redskins put up 27 points, and Terrelle Pryor, with Jordan Reed absent from the lineup, only caught 2 of 4 targets for 19 yards and 0 touchdowns, scoring 3.90 fantasy points. Pryor’s season totals now sit at 10 receptions for 116 yards and 0 touchdowns - not the type of production one would expect from a late third/early fourth-round pick in most drafts. Martavis Bryant finds himself as a disappointment to fantasy owners for the second time in three weeks, hauling in only 2 of 8 targets for 30 yards, with no touchdown. Bryant totalled 5.00 fantasy points in full PPR leagues and remains the third option at best on a crowded Steelers squad. As Big Ben and the Steelers’ home/road splits continue to be a thing, Bryant is better kept on the bench when playing away from Heinz Field. The highest scoring tight end in full-point PPR leagues had only previously scored 3 touchdowns in the past 3 seasons. Jaguars’ Marcedes Lewis, seemingly out of nowhere, was heavily involved in the red zone, hauling in 4 receptions for 62 yards and 3 touchdowns, for a total of 28.20 fantasy points. For the second time in as many weeks, Patriots’ Rob Gronkowski has been a top 2 scoring tight end. This week, Gronk caught a team-high 8 receptions for 89 yards and a touchdown, scoring a total of 22.90 fantasy points. After catching all 7 targets for 80 yards last Sunday, Hunter Henry scored 0.00 fantasy points and saw no targets against the Kansas City Chiefs. Through 3 weeks, Henry has received 0 targets in two games so far. At this point in the season with Gates still healthy, Henry cannot be started with any confidence moving forward. Travis Kelce didn’t have himself much of a better game, scoring only 1.10 fantasy points after catching his only target for 1 yard. This again was a let down after Kelce exploded last week for 8 receptions for 103 yards and a touchdown. There was a common theme with this week’s highest scoring Defense & Special Teams: they were all underdogs going into their matchups. The Cincinnati Bengals, New York Jets, and New Orleans Saints defense all finished the week ranked 1st with 14.00 points. The Bengals accumulated 6 sacks, along with an interception that was returned for a touchdown. The New York Jets had 3 sacks, 2 interceptions, and only allowed the Miami Dolphins offense to score 6 points. Finally, the New Orleans Saints had 4 sacks and 3 interceptions against the Panthers offense this Sunday. The highest scoring kickers from this past week with 18.00 fantasy points each were Matt Prater from the Detroit Lions and Steven Hauschka from the Buffalo Bills. Prater kicked field goals from 35, 40, 55, and 57 yards out while converting 2 extra points. Hauschka was equally as impressive, making three field goals from 27, 49, 53, and 55 yards out, while also converting 2 extra points.